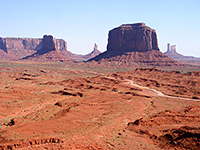 The area lies entirely within the Navajo Indian Reservation on the Utah/Arizona border; the state line passes through the most famous landmarks, which are concentrated around the border near the small settlement of Goulding - this was established in 1923 as a trading post, and provides basic visitor services. A paved side road heads past the village to the northwest beneath Oljeto Mesa and has views of other less-visited parts of the valley, then another route (the unpaved Piute Farms Road) continues all the way to the shores of the San Juan branch of Lake Powell. 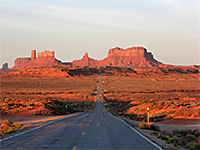 There is only one main road through Monument Valley, US 163, which links Kayenta, AZ with US 191 in Utah. The stretch approaching the AZ/UT border from the north gives the most famous image of the valley, and possibly of the whole Southwest - a long straight empty road leads across flat desert towards the 1,000 foot high stark red cliffs on the horizon, curving away just in front. 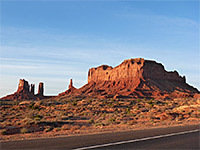 The highway cuts through the mesas at Monument Pass, near which several dirt tracks leave both east and west and criss-cross the red sandy landscape, offering a more close up appreciation of the rock formations, although these roads lead to Navajo residences so some discretion is necessary when visiting. This is also a good area for hiking, though there are no official trails. 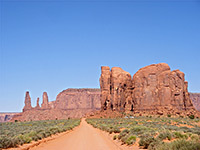 One possible route is around the group of formations on the southeast side of Monument Pass - a cross country trip of about 4 miles that involves traversing various small washes, cliffs and mesas. Although much can be appreciated from the main road, a lot more of the landscape is hidden from view behind long straight cliffs (the Mitchell and Wetherill Mesas), east of the road on the Arizona side (see overview map). 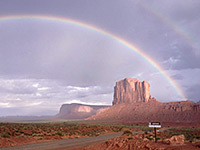 This is contained within the Monument Valley Navajo Tribal Park (entrance fees increased to $20 per vehicle in 2014), reached along a short side road directly opposite the turn-off to Goulding. 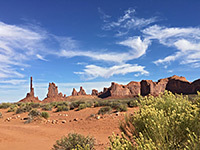 From the visitor center at Lookout Point there are good views across three of the valley's most photographed peaks - East and West Mitten Buttes, and Merrick Butte. 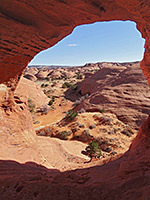 The park has only one hiking path, the 3.2 mile Wildcat Trail which starts just south of the visitor center and loops around West Mitten Butte. Away from the park are other scenic backcountry areas, including Mystery Valley, on the opposite (west) side of Wetherill Mesa. 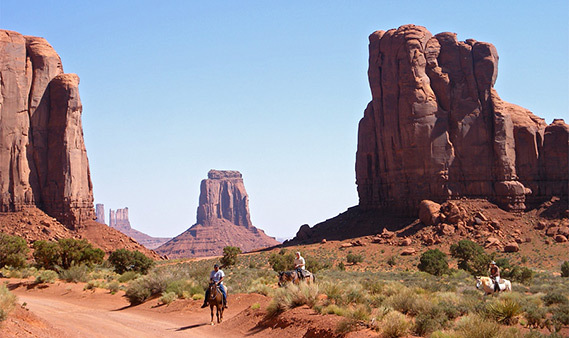 This may be visited on half-day tours starting at Gouldings Lodge; highlighs are arches (Skull, Honeymoon and Pine Tree), pictographs, petroglyphs and Anasazi ruins. 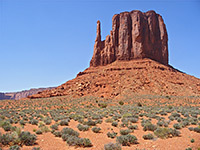 which starts at the visitor center and heads southeast amongst the towering cliffs and mesas, one of the most famous being Totem Pole, an oft-photographed spire of rock 450 feet high but only a few meters wide. The road is dusty, steep in a couple of places and rather uneven, but does not need 4WD - unless after recent heavy rain, the journey is suitable for the majority of family cars, and small to medium sized RVs, though the surface is perhaps not improved too much in order to increase business for the many Navajo guides and 4WD jeep rental outfits, which wait expectantly by the visitor center - typical prices are around $75 for a 2 hour trip (though cheaper tours are available from Gouldings Lodge). As well as eroded rocks, this area also has ancient cave and cliff dwellings, natural arches and petroglyphs, all generally away from the Valley Drive at more isolated locations and viewable only as part of guided tours. The Valley Drive passes 11 numbered stops at the most scenic places, and a typical journey around the loop takes at least 2 hours. Tourists are not allowed to hike away from the road closer towards any of the formations, but even so the trip is very enjoyable. 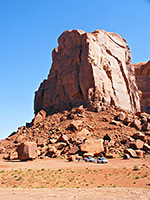 Accommodation in the center of Monument Valley is limited to Gouldings Lodge and the recently built View Hotel in the tribal park - both rather expensive - so most people prefer to stay 23 miles south in Kayenta, a town with only one chain hotel following the closure of Holiday Inn Kayenta and Best Western Wetherill Inn. Hampton Inn of Monument Valley - Hilton is represented in Kayenta by the three floor, adobe-style Hampton Inn of Monument Valley, a modern building on the north side of US 163, close to gas stations and a shopping center, but within sight of empty desert in all directions. Accommodation comprises 73 rooms, decorated with Native American motifs, and equipped with a pull-out sofa, work desk, coffee maker & hairdryer. The hotel also offers a welcoming fireplace lobby, an outdoor pool, patio with gardens, business center, free continental breakfast and guest laundry.